This recipe is so quick, easy, and healthy! We’ve been eating it at least twice a week since the weather got nice enough to grill again. Various spices or seasoning similar to the ones below. One is just a generic all purpose seasoning and the other is sold at our local grocery store for meats. You really could use just about any meat or seafood seasoning, because we alternate and try out different seasonings all the time. I just happen to like this combination these days. Another spice I like to add to this recipe or just veggies in general. TJ is the best! 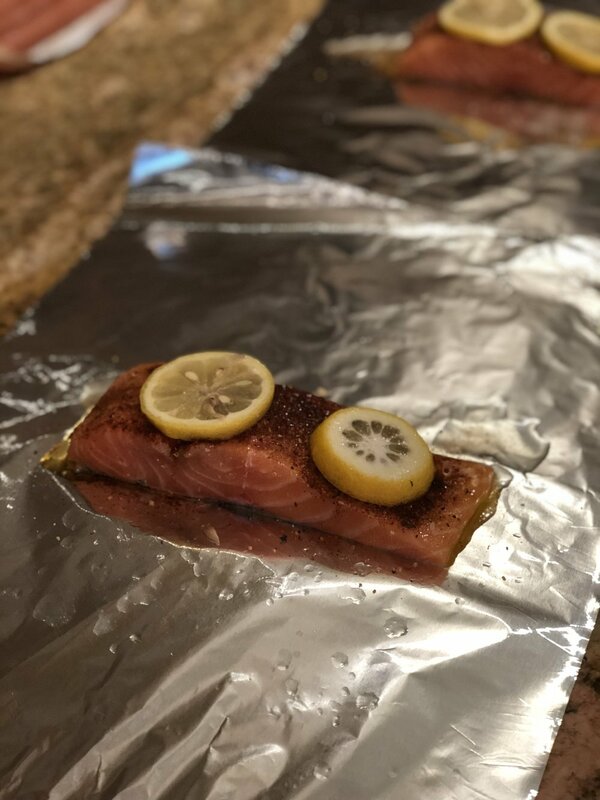 Place salmon fillets skin side down in one square piece of foil per filet. Sprinkle seasoning generously on top of the filet and place lemon slices along the top. Note: you could totally add some cut veggies to this foil packet! I have been using veggie kabobs a lot lately, but adding veggies to this turns out great! Cook on direct heat (over the flame) for 10 minutes with flames turned up about half way (medium) which is about 500 degrees inside. So easy, healthy, and delicious.